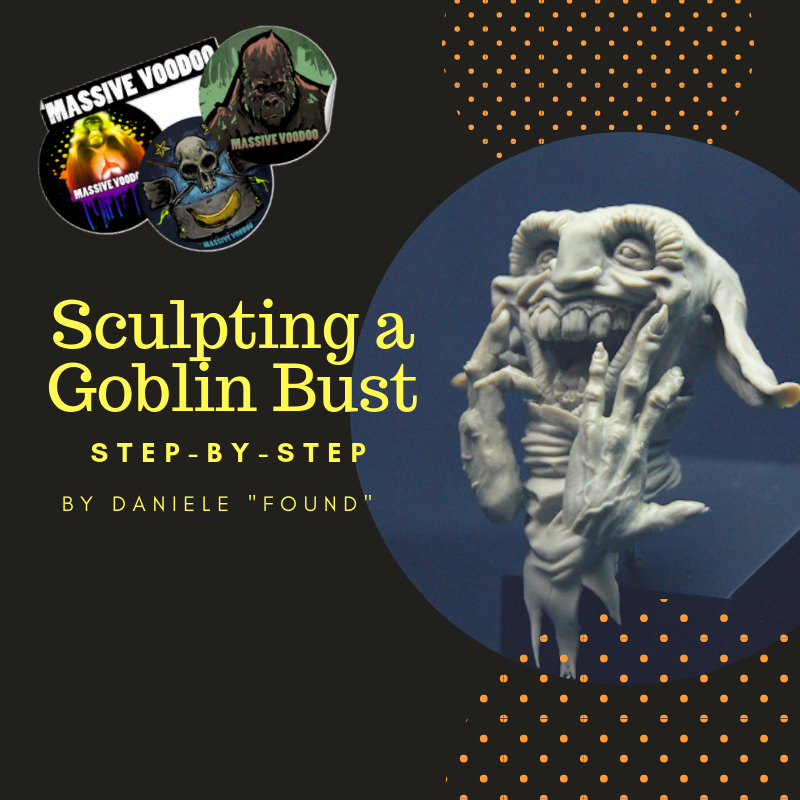 This is Daniele and today I'll show my process to sculpt a little Goblin Bust. First of all, I fixed a solid wire in a wooden base, and I placed another metal wire thinner than the first one, this to create a firm base on which I'll put the clay. To sculpt a head, whatever it is, you have to always starts from simple sphere. In this case I didn't have the need to make an "anatomically correct" face. He is a Goblin, so remember three words: exaggeration, improvisation, fantasy. That's why I sculpt fantasy stuff: I like to use my own fantasy :-) "Normal face" are also good, but can be also booooring!! After created the first shape of the head i baked the clay. I did this because it is more easier to sculpt whan you have something "solid" under your hands. After, I baked it I finished the skull structure using some drills and my little Dremel. This base "hard" structure is fundamental﻿. Especially for this character, because the mouth is wide open, and its really difficult to sculpt inside it without have a solid base. This is why i baked it previously. My advice in sculpting process is : GO ROUGH! The more time you spend in sketching, the best result you'll get at the end. Sculpting is a time consuming process, you need time in order to obtain best result. Often i use clay shaper to smooth little details. You can buy them in a cheap way on china store or similar, but I suggest you to buy professional tool (especially the rounded one). The tip of clay shaper is so delicate so if you spend money to get a good tool, you'll reserve your time after. I put first masses to create the bandana, and create first base for the ears. I can't sculpt directly on the ears because they hasn't an armature inside, so i need to baked them and then working on later. To create drapery I suggest you to find some references useful for this. To create drapery you need experience, patience and attemps. There's no magic trick to do this. then i smooth with some turpentine and a good brush. To complete the bandana, I need to create the Flying part. To do this i pick up a little piece of clay. Then I put it between two pieces of paper baking. This happen when you use too many baby powder. too many -> the clay will attach to paper. too much -> it creates some unwanted texture on clay. I bought it in my city Brico Store. It's so useful in modeling, and the blade is replaceable. Often i use this tool made by me to create some clay sausages: It's a round piece of plexyglass with a little hook created in Milliput. I Always recommend to use it over a piece of simple paper. Clay never sticks on paper. To create hands, i baked to pieces of square clay and put some wire to create the fingers armature. To create veins put a little sausages on surface, them smooth them with some turpentine. You can see there's a lot of asymmetry: I wanted this because it put a little personality to the character.